Leaders learn from mistakes. I have given a lot of thought to the many mistakes I have made over the years. These have often resulted when I have to make a decision without the benefit of all the facts. For any other leader out there this should strike a chord, because most, if not all, of our decisions are made without knowing with absolutely certain what the outcome will be. Great leaders know leaders learn from mistakes. When the first truckload of brand new classroom furniture arrived for our growing school I was very excited. We had been operating with homemade desks and a menagerie of used chairs. New, purpose built furniture was a huge step up for us. My excitement died quickly when I opened the invoice for transport. I nearly fell off my chair. The transport cost was higher than the total price of all the new furniture. I rang the company to point out their mistake. They explained to me I had asked for the furniture to be delivered overnight. I rang the furniture company, sure this was their mistake. In turn, they reminded me that when they asked me I had asked them to use whatever transport they would normally use. It slowly sank in that this huge financial mistake was my fault. I rang the transport company back, took full responsibility admitting my mistake. They graciously halved their invoice. I knew the Chairman of the School Board would not be happy. The thought crossed my mind he might even sack me. I went to see him, told him the story, taking full responsibility. I offered to pay the difference between the invoice and the cost of rail transport, which was the cheapest mode available. To my relief he made it clear to me that we were building an organisation in which blame would not play a part. One in which no one would pay the cost of an honest mistake by themselves. We chatted for a while about the processes we needed to put into place to ensure this mistake wasn’t repeated by someone else. Then he just trusted me to get on with the job. Leaders learn from mistakes. I learned so much from this experience. It has informed my leadership practice for over thirty years. On reflection, it was one of my earliest encounters with Fourth Question Leadership in practice. Leadership which seeks to put the interests of others first. We benefit far more when we are helped to learn from our failures and mistakes than we ever can if we wear the cost. I am so glad I had a mentor early on in my career who understood leaders learn from mistakes. We learn early in life that success brings more immediate reward than failure. Our lives take on a preference for success and being seen by others to be successful. Children quickly learn blame avoidance strategies such as blame shifting. Admitting mistakes and failures becomes counter intuitive for us. We take this way of thinking about mistakes into our work places as adults. 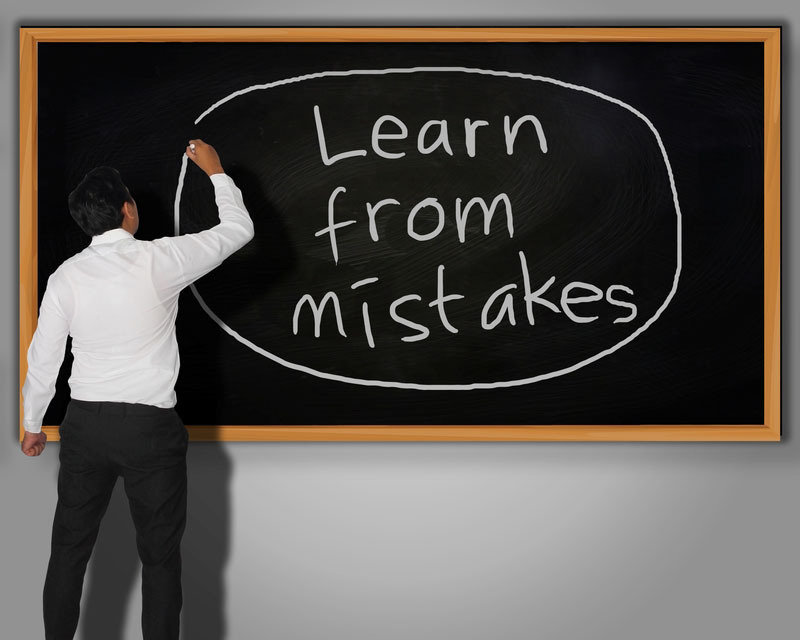 For organisations to maximise the learning opportunities from mistakes it must be safe to admit and discuss mistakes and failures. When a team can explore what it was they did or did not do that led to the mistake in a reflective debrief everyone will benefit from the lessons which emerge. This organisational culture develops when leaders focus on what happened. When everyone knows the organisational response to failure or a mistake is to try to learn as much as possible and to make sure that everyone benefits from these lessons, people will be much more willing to admit when they have made a mistake and to discuss it openly. Everyone operates with the knowledge that leaders learn from mistakes. I am not advocating an approach that encourages failure. Not at all. Just one which seeks to maximise the learning when the inevitable mistakes happen. One which seeks to bring out the leadership potential in all and teaches the lesson leaders learn from mistakes. “That is the worst decision you have ever made.” These angry words were a thrown at me by a team member early one morning. We had experienced days of continuous rain and a heavy downfall during the night. I had made the decision to keep the school open for the day even though other schools were closing. There was a risk the school grounds could be inundated at high tide. While the water certainly came close to entering rooms, it didn’t. As the tide receded so did the water. In the afternoon the angry team member emailed a humble apology to me. He made the observation I had been right. It is not when you are right that you need the most support. It is when you are wrong. Leaders learn from mistakes. The real lesson here is – it works the same way for them! The members of your team will appreciate your encouragement and acknowledgement when they make good decisions. They will really value your support when it comes after they have made a mistake. It is much harder to be supportive in the wake of mistakes than it is after success. We learn as much, if not more, from our mistakes than from our successes. Leaders learn from mistakes. There are very few mistakes I see others make I cannot remember making myself. In truth, I am the accumulation of the lessons I have learnt from my mistakes. What might pass as success today is only present because others took the time to help me work through the lessons in my mistakes. Your most valuable employees and team members will be the ones you take the time to help work through mistakes and failures. Leaders learn from mistakes – I know this one has. Don’t let a good mistake or failure go to waste! Leaders learn from mistakes. The members of your team need your support far more when they get it wrong than when they get it right. We benefit far more when we are helped to learn from our failures and mistakes than we ever can if we wear the cost. Within an organisational culture which focusses on what happened rather than attributing blame everyone will benefit from the lessons which emerge.